Daimer.com released its first PDF for car detailing upholstery cleaners featuring specs and details on the value-priced XTreme Power® XPC-5700U. Daimer Industries, Inc.®, among the top search engine ranked Web resources for commercial cleaning systems, published free downloadable product brochures for the auto detailing XTreme Power® XPC-5700U upholstery carpet cleaners. The brochure, the first widely offered by Daimer®, is available from the company’s Daimer.com web site. Daimer®’s newly published brochure for the XPC-5700U is a PDF document that can be downloaded and viewed on a variety of different Apple, Windows and handheld platforms. The document for the popular auto detailing upholstery cleaner consists of two pages. The first page shows photos of the product and its common uses. (In addition to auto detailing, the machine can be used for a range of upholstery applications, including the cleaning of residential and business furniture. 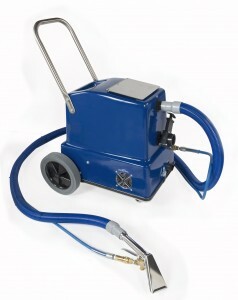 The second page includes a description of the XTreme Power® line of carpet cleaners and upholstery cleaners, as well as a description of the unheated XPC-5700U and recommended applications. A complete specification chart lists the machine’s attributes and capabilities. For example, the auto detailing machine offers a pump pressure level of as much as 120 psi plus a low flow technology for faster drying all in a compact unit that weighs 55 pounds. Daimer® plans to announce downloadable product brochures for additional auto detailing systems in the coming months. For additional information about Daimer®’s industrial car wash equipment, mobile car wash equipment, or portable carpet cleaner systems, visit www.daimer.com/auto-detailing/ or call Matthew Baratta at (888) 507-2220. Daimer® car wash equipment is available to customers in most countries. Minimum order quantities may apply. Daimer®, www.daimer.com, is a major supplier and worldwide exporter of the cleaning industry’s leading line of KleenJet® steam cleaners/vapor steam cleaners/steam cleaning equipment; Super Max™ commercial and industrial pressure washers, including cold water, hot water, and steam pressure washing machines; and XTreme Power® floor cleaners, including carpet cleaners, upholstery cleaner and hard surface cleaners.